These are so amazing I have to break my summer hiatus and share. I wanted to use up my 25 pound bag of Honeyville Almond Flour so I’ve been baking like a nut. I’ve not made oatmeal raisin cookies in years but I had some of my favorite gluten free oats left as well as raisins and walnuts on hand. So of course I had to try. Well these greatly exceeded my expectations. By the way these make a great breakfast with a nice hot cup of tea or coffee. 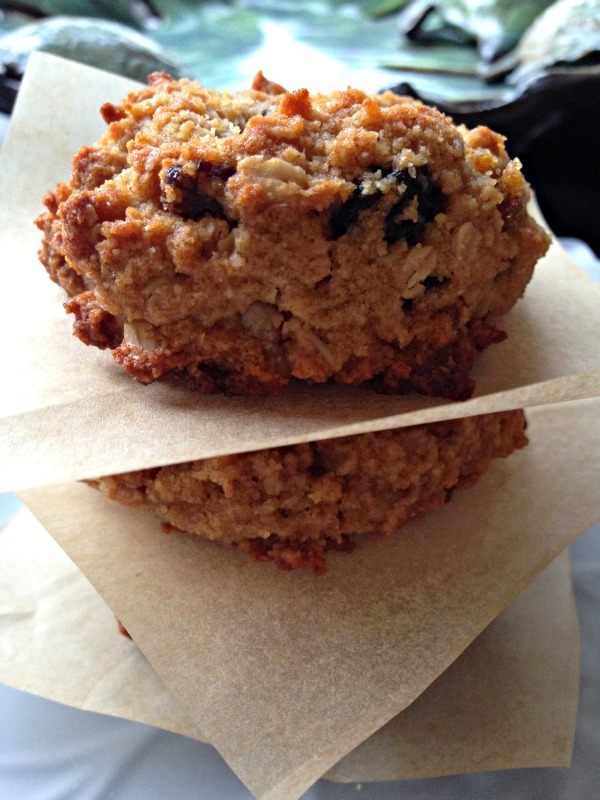 If you are a fan of the moist, soft, chewy cookie then you’ll love these. Preheat the oven to 350. Line large baking sheet with parchment paper. In a large bowl, combine the almond flour, salt, baking soda, cinnamon, raisins and oats. In a medium bowl, whisk together the grapeseed oil, coconut nectar, vanilla and water. Using a Stainless Steel Scoop, 4 Tablespoon , scoop the dough and place on the prepared making sheets and then flatten a little with your hand or the back of a fork. Bake for 8-12 minutes, until they are lightly brown. Remove from oven and allow to cool down enough to pick up and eat. You don’t want to pop one into your mouth as soon as you take them out of the oven or you’ll burn the heck out of your mouth, take it from me. Note: Some of the links provided are affiliate links. * For the gluten free oats my favorite are the Montana Gluten Free. If you don’t have coconut nectar and don’t follow the link provided to order some, then you can substitute agave or yacon syrup or even regular sugar. If you go with the regular sugar you will probably need to increase the amount of water to balance off the liquids provided in the recipe. Just start with a teaspoon and add from there. Remember you can always add more so start small. You’ll want to be able to have the dough hold together. These look amazing Diane! 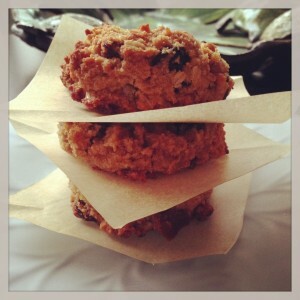 I'm a sucker for a good oatmeal raisin cookie and they always have to be chewy or fluffy (I'm not a crispy cookie gal). Pinned!